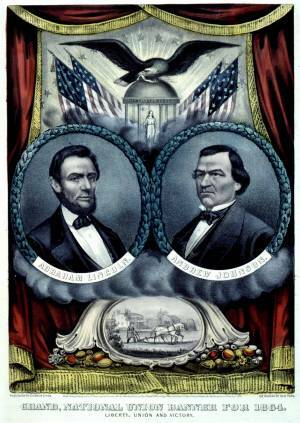 A campaign banner for 1864 Republican presidential nominee Abraham Lincoln and running-mate Andrew Johnson, a War Democrat. A drawn curtain reveals bust portraits of the two candidates in roundels framed with oak leaves. Above the portraits is a "Temple of Liberty", within which stands Lady Liberty holding a staff and liberty cap. Four American flags flank the temple. Perched on the temple’s dome is an eagle with spread wings holding a banderole in his mouth and arrows in his talons. Rays of light ending in stars emanate from the temple.